J.R Smith Might Crack the Starting Lineup. Will He? Should He? 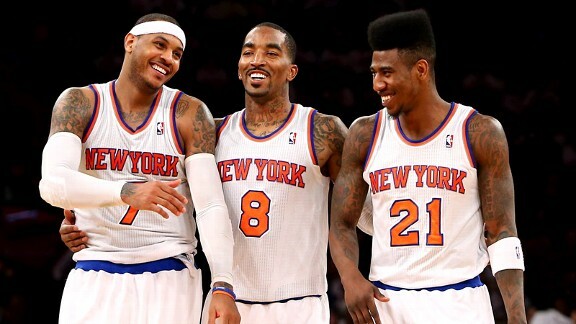 Raymond Felton, Carmelo Anthony, and Tyson Chandler will start for the Knicks this season. Beyond that, the rotation is quite unclear, but Knicks fans were given a bit of info on the situation Wednesday. Knicks Coach Mike Woodson said Wednesday that there is an open competition between J.R Smith and Iman Shumpert for the starting Shooting Guard position. Smith had a great year last year, taking home the NBA’s Sixth Man of the Year award, but flamed out in the playoffs (during which he battled injury, suspension, and himself). Shumpert missed the first couple months of the season recovering from an ACL tear and struggled a bit once he got back, but finished the season strong and had a solid postseason after regaining his explosiveness. Both players are battling health issues: Smith had knee surgery during the offseason and is expected to at least miss most of the preseason, while Shumpert has said he felt a bit of knee soreness (which he says was to be expected) this summer following his comeback from the torn ACL. 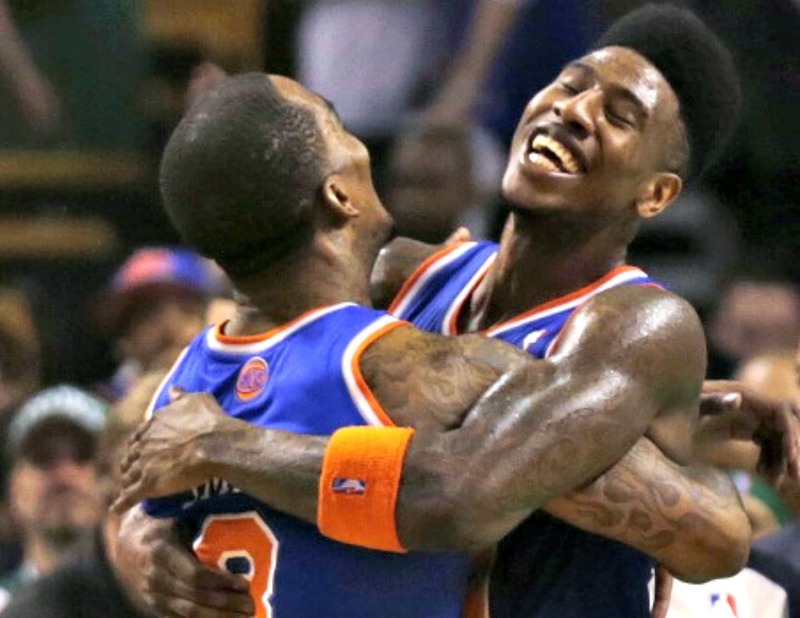 I’m going to let [Smith and Shumpert] fight it out… I want [Smith] to be past that Sixth Man. Let somebody else get the Sixth Man if he deserves to get that starting job. Last year was last year. Why not grant him that opportunity? That’s not to say he’s going to win it, but I’m not telling him he’s not going to start… [Starting] frees him up to maybe expand his game and be better for our ballclub. I don’t know, but we’ll see. So who should start? Well, when both are healthy, Smith is clearly the better player (although Shumpert has great potential). However, putting Smith in the starting 5 instead of Shumpert could greatly hurt the defense Coach Woodson gets out of his first unit. Carmelo Anthony is a subpar defender due to a lack of effort, Raymond Felton is a defensive (albeit tenacious) defender at best, and Andrea Bargnani’s defense is atrocious unless his man is only a few feet away from the hoop (in which case it is actually very good, as stats have shown). And Tyson Chandler can’t do it all himself; taking Shumpert’s fantastic defense out of the starting lineup could be a huge mistake, even though Smith is decent on the defensive end. Another issue with starting Smith is his nature as a scorer. Carmelo Anthony is the main scorer in the first unit (as you may have heard), and the Knicks rely on Smith to give them a solid scoring punch when the second unit takes the floor. Putting Smith in the starting lineup would hurt the offense of the second unit. But starting Smith would increase the offensive production from the first unit, negating the negative impact on the second unit, right? Wrong. Again, Carmelo is the primary scorer whenever he is on the floor. So when Carmelo is on the floor, this means 2 things. You probably just nodded while reading those 2 things. If you happen to be Amar’e Stoudemire, you may have even let out a sigh. When Melo is on the floor, Melo is going to shoot, something which he has earned the right to do by establishing himself as one of the game’s premier scorers. But if J.R and Melo spend more time on the court together, it means that J.R Smith will spend more time doing what Iman Shumpert did last season: standing on the floor without the ball. Iman Shumpert is a much better off-ball player than Smith due to his unselfishness, athleticism, and most important his fantastic defense. J.R needs the ball to have a big impact on the game. Iman Shumpert does not. Therefore, I believe that Iman Shumpert is better suited for the Melo-led first unit, J.R is better suited to lead the second unit, and Coach Woodson would be wise to keep these things in mind. But who will start? 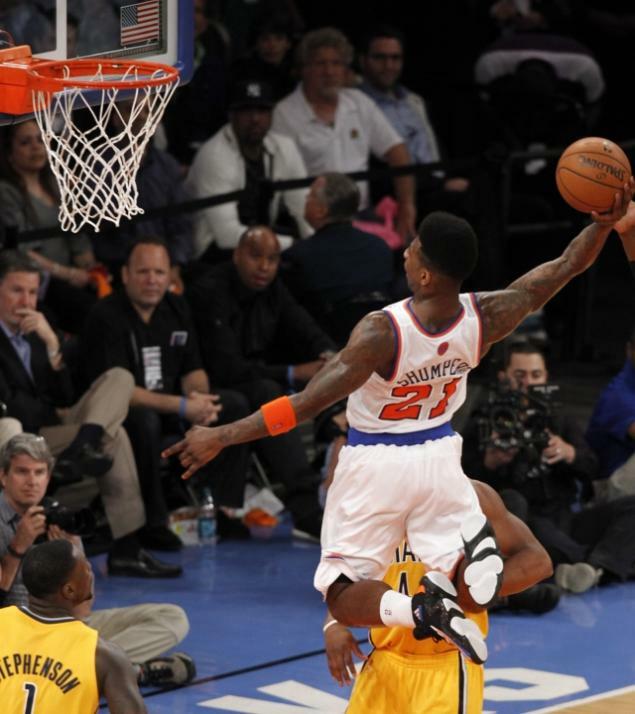 Again, I say Shumpert. 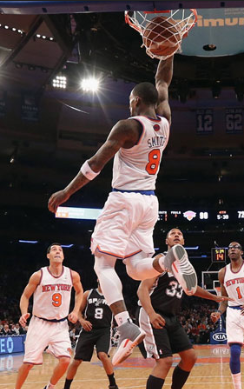 For one, Smith’s injury problems are larger than Shumpert’s right now. In addition, Smith will already miss the first 5 games of the season regardless of the state of his knees due to his suspension for violating the league’s recreational drug use policy. And most importantly, Shumpert started last year, and Coach Woodson is not a man who likes to change the way he does things. It is important to note that both players have indicated that they will be happy in either role, so hopefully team chemistry will not be affected by this competition. 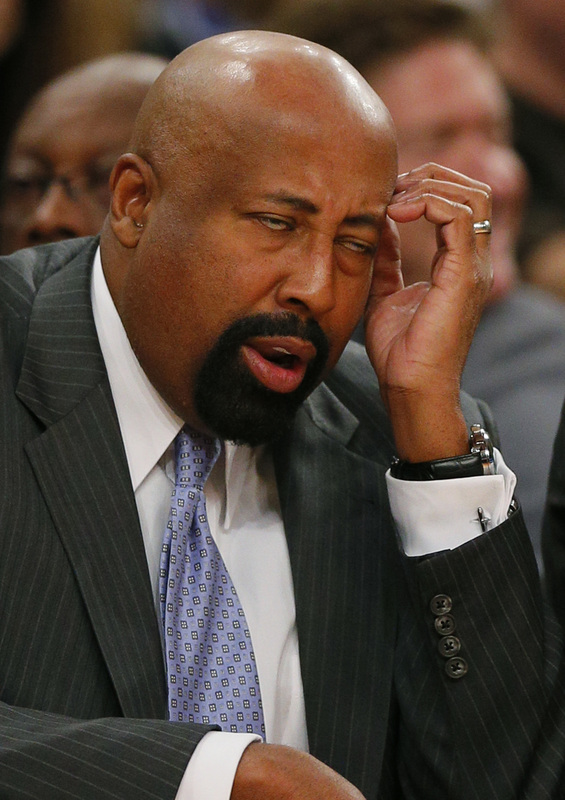 Of course, there’s a chance that neither player starts if Coach Woodson goes back to those two-point-guard lineups. 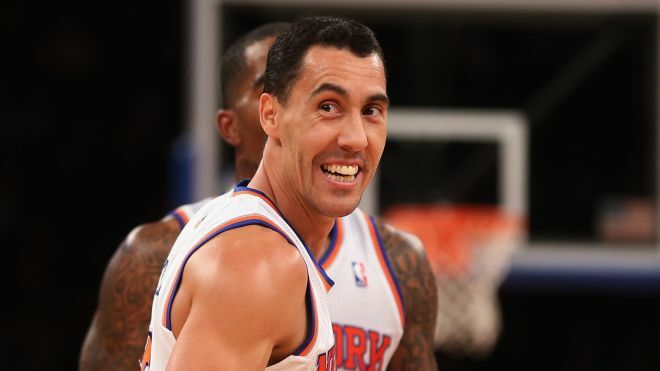 Pablo Prigioni, anyone? This entry was posted in Articles and tagged Carmelo Anthony, iman shumpert, iman shumpert start, iman shumpert starting lineup, jr smith iman shumpert starting lineup, jr smith start, jr smith starting lineup, knicks blog, knicks lineup, KNICKS MEMES, Knicks news, knicks rumors, knicks sixth man, knicks starting lineup, mike woodson, new york knicks, raymond felton, Shumpert, Smith, Tommy Rothman, tommy rothman knicks, tyson chandler on October 9, 2013 by Tommy Rothman.